In the long history of humankind, those who learned to collaborate and improvise most effectively have prevailed. 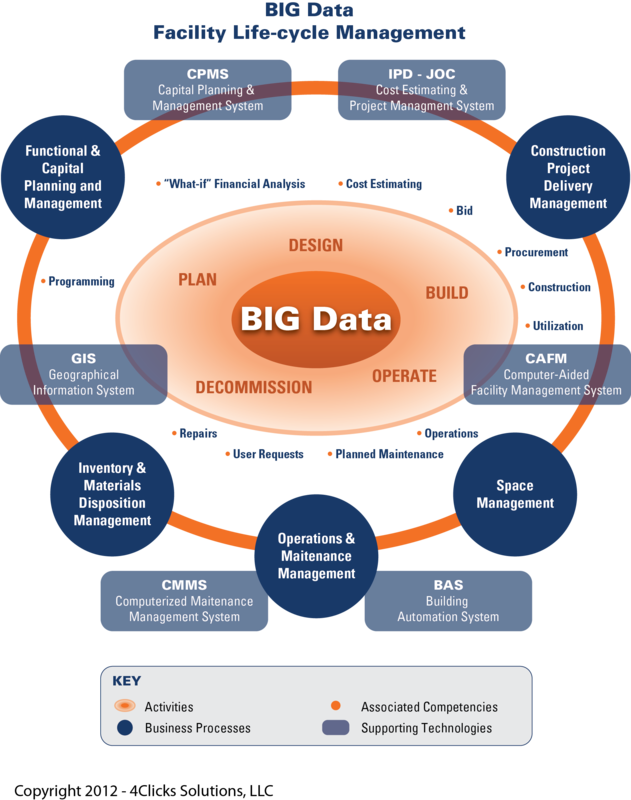 BIM, the life-cycle management of the built environment supported by digital technology, requires a fundamental change in how the construction (Architects, Contractors, Engineers) and facility management (Owners, Service Providers, Building Product Manufactures, Oversight Groups, Building Users) sectors operate on a day-to-day basis. BIM, combined and Cloud Computing are game changers. They are disruptive technologies with integral business processes/practices that demand collaboration, transparency, and accurate/current information displayed via common terminology. The traditional ad-hoc and adversarial business practices commonly associated with Construction and Facility Management are changing as we speak. Design-bid-build and even Design-Build will rapidly go by the wayside in favor of the far more efficient processes of Integrated Project Delivery – IPD, and Job Order Contracting – JOC, and similar collaborative programs. (JOC is a form of integrated project delivery specifically targeting facility renovation, repair, sustainability, and minor new construction). There is no escaping the change. Standardized data architectures (Ominclass, COBie, Uniformat, Masterformat) and cost databases (i.e. RSMeans), accesses an localized via cloud computing are even now beginning to be available. While historically, the construction and facility management sectors have lagged their counterparts (automotive, aerospace, medical, …) relative to technology and LEAN business practices, environmental and economic market drivers and government mandates are closing the gap. The construction and life-cycle management of the built environment requires the integration off several knowledge domains, business “best-practices”, and technologies as portrayed below. The efficient use of this BIG DATA is enabled by the BIM, Cloud Computing, and Integrated Project Delivery methods. The greatest challenges to these positive changes are the CULTURE of the Construction and the Facility Management Sectors. Also, an embedded first-cost vs. life-cycle or total cost of ownership perspective. An the unfortunate marketing spotlight upon the technology of 3D visualization vs. BIM. Emphasis MUST be place upon the methods of how we work on a daily basis…locally and globally − strategic planning, capitial reinvestment planning, designing collaborating, procuring, constructing, managing and operating. All of these business processes have different impacts upon the “facility” infrastructure and construction supply chain, building Owners, Stakeholders, etc., yet communication terms, definitions, must be transparent and consistently applied in order to gain greater efficiencies. Some facility life-cycle management are already in place for the federal government facility portfolio and its only a matter of time before these are expanded and extended into all other sectors. Many remain confused about the meaning and value of BIM (building information modeling). BIM is the efficient full life cycle operation of the built environment, with the promise of managing Total Cost of Ownership (TCO) and associated physical and functional conditions in concert with an organization’s changing needs. This is a radical departure from the current focus upon “first cost” or ” initial cost” mentality. BIM is NOT 3D modeling (Revit, Archicad, Bentley, etc. ), although some vendors tend to perpetuate this myth. BIM is the visualization and modeling of the built environment to assist in associated decision support, via ANY means, leveraging digital technology. Traditionally, construction projects are managed in silos, for example – design, engineering, procurement, construction, operations, etc… all in there own neat (or not so neat) little containers. Integrating this information, collaborating with this informati0n, and providing the Owner with the ability to leverage accurate, transparent, timely information for ongoing decision support is practiced by an elite few… likely less than 5% of the AECOO (Architecture, Engineering, Construction, Owner ,Operations) sector. The end result it that we, and an industry sector, continue to experience rampant waste, low productivity, and an antagonistic environment littered with legal squabbles. BIM, in its true form, offers ,significant cost savings and productivity improvements for all stakeholders, as well as long lasting, positive, and mutually beneficial relationships. Who owns the information? – The Owner must have ownership, however, this ownership can be, and should be… in most cases, shared with the creator. Who was responsible for it and liable for the errors contained therein? – The Owner, and or Owner’s representative. as they are managing the process, however, a basic acceptable level of performance must be established for all parties. How is the information collected and migrated? – Via open, transparent data architectures and lexicon. For example, OMNICLASS, Masterformat, Uniformat, COBIE (once it gets sorted out). Who was controlling the project? – At the end of the day, whoever pays the bills… always has worked best this way, thus the Owner or Owner’s representative. In whose interest where the parties working? – Mutual, product completed to benefit and requirements of the owner, on-time, and on-budget. How would the project be procure? IPD, JOC and similar methods that incorporate procurement, project management relationships and responsibilities, data architectures and formats, etc. Sure, standards for guidance are evolving, however, several “best practice” business process alread exist and can easily be extended. It is critical to remember that business strategy, processes, and workflow are the important area of focus, technology plays a supporting role. Unfortunately, manner tend to approach BIM from a technology perspective…. an approach doomed from the start.